A blog offers a wonderful opportunity for navel gazing and general self-absorbtion, but even I find it tedious to talk about myself too much. How could you cope?? Whilst I’m always open to tell you what’s happening in Eastbourne, I reckon it’s more interesting to see how real guests have enjoyed Eastbourne, The Guesthouse East and the many activities, sights and attractions within very easy reach. I’ve added our very own Guest Gallery – where you can peer into others’ adventures around Eastbourne and Sussex. I’m kick-starting with Kiwamu and his family from Kyoto. 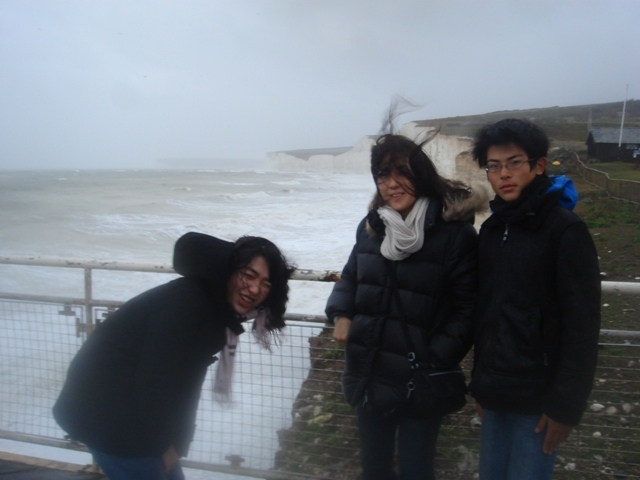 Only here for day, they were on a mission to see Beachy Head and the Seven Sisters (which served as the backdrop for some of Harry Potter’s antics – v big in Japan apparently), but the wind was violent, the light fading and the wind battering the coast. Still, Sarah was away with the children for the afternoon so I took Kiwamu and the guys up to Birling Gap to experience the full might of the elements…. So…I’d like to see more of your photos, hear more of your stories and let you star in our blog (in lastminute.com’s Top 10 travel blogs don’t you know 🙂 ) and in the gallery and from there you can share it with your friends and family (I’ve also added easy bookmarks for sharing). Email pics to book@theguesthouseeast.co.uk and/or comment on the blog itself (just click on ‘comments’).